monks passing our guest house to receive alms from about 5:30 to 7. It was the beginning of another great day in this tropical paradise. 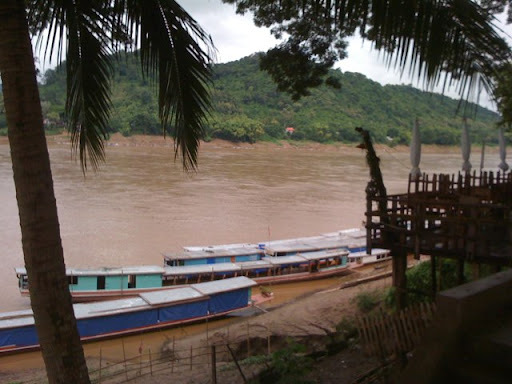 The centerpiece event was when Chris, Tania, Theo, Jackson, Rachel and I boarded a small, 16-passenger longboat at noon to take an hour-long journey south on the Mekong. Then we hopped in the back of a pickup truck to complete the trip to Tat Kuang Si, a many-tiered waterfall tumbling down over limestone formations. Lonely Planet called the many swimming areas along the hike up to the falls "turquoise," but they were really just mud-colored, likely because of the heavy rains in the early morning. We climbed all the way to the top (Rachel with Jackson on her back in a papoose sack, I might add), something not attempted by most of the visitors there. Then we went swimming under a smaller set of falls, with Chris and Tania jumping from a ropeswing, something I wasn't interested in trying, probably because of memories of my famous "Library of Congress flagpole-swinging" incident. The return boatride was two hours upriver and we arrived a little after dark, but our captain, The General, was a good sport about how long we had lingered at the falls. Rachel, Jackson and I ate dinner at a French-Laos restaurant right next to our guesthouse that ended up being a great suprise. We had amazing pumpkin crouton soup, fried ginger cheeseball salad, and real-deal panang chicken casserole. We then met the rest of the gang around the corner for late-night drinks at a Belgian bar (late night not being that late night in Luang Prabang, where the town shuts into curfew mode at 11:30 each night).